Some tourism businesses not only benefit the local community but are actually run by the local community. This award recognises the efforts of volunteers in a very special visitor centre. It is a place from which we all benefit because they send visitors on to each of our businesses. The centre is managed entirely by dedicated volunteers providing a great visitor experience including tourist information along with special historical displays. The venue is always well presented and welcoming, and special exhibitions always involve the local community. 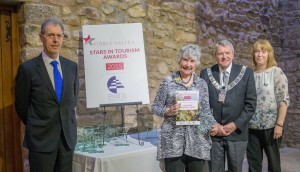 This award goes to the Volunteers of the Longridge Heritage Centre.